CEDAR CITY- Monday morning, 126 professional cyclists from all across the globe will soar through a 113.5- mile course that begins and ends in Cedar City. The event is the first stage of the seven total stages in the Larry H. Miller Tour of Utah. This prestigious race is globally recognized as a leading international cycling competition that follows Tour de France. Sixteen teams from around the world will race in the Tour of Utah, including participants who will be racing on American soil for the very first time. 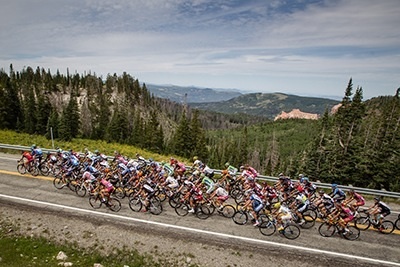 Last year, 15,000 spectators in Cedar City were joined by 200 million viewers watching the race from around the world. “It’s a postcard of your area to the world,” Byron Linford, event coordinator for Cedar City, said. Race registration will begin at 9 a.m., and athletes will participate in a meet-and-greet with fans near the starting line at 85 N. Main St. in Cedar City. Participants will sign autographs until the race begins at 10:40 a.m. Stage one of the race will pass through Parowan Gap, up a steep incline to Parowan Canyon, through Brian Head and Cedar Breaks National Monument, along the lava fields in Mammoth Creek and down a 4,000-foot descent through Cedar Canyon, ending back in Cedar City. Estimated finish time for the racers is about 3:45 p.m.
Spectators are invited to watch the race from different vantage points in downtown Cedar City and also between Center Street and 200 North. Team introductions will take place Saturday night at Main Street Park in Cedar city between 6-8 p.m. Anyone desiring to meet the athletes is invited to attend. There will be entertainment and live music. When: Monday, August, 4 | Registration 9 a.m. | Race begins 10:40 a.m.
it would be nice if you would put what road closures we can expect and times they will be closed. Seriously? “15,000 spectators in Cedar City were joined by 200 million viewers watching the race from around the world”? 200 million people watched the race last year on TV? Hey, it’s your credibility…..
I’m not sure what you’re doubting, Mr. Davey? May I invite you to visit http://www.tourofutah.com/ – wander through its Web pages – there’s considerable information to get lost in there. The 2013 numbers that, if I understand your comment correctly, widened your eyes were given to us by Byron Linford, event coordinator for Cedar City.